Chris Wolff (Ben Affleck) is an autistic CPA, who uses his unique gift with numbers to help criminal organizations find those among their own who are embezzling money. Raymond King (J. K. Simmons) is a Treasury Department official who’s been tracking Wolff for years in an effort to crack down on those same criminal organizations. But each man’s story is more complicated that it seems. After being hired by a prominent robotics firm to find missing profits, Wolff’s life is changed when his work puts one of the company’s own accountants, Dana Cummings (Anna Kendrick), in grave danger. Meanwhile, when King blackmails a new Treasury agent (Cynthia Addai-Robinson) into helping him uncover Wolff’s identity before he’s forced to retire, she uncovers far more than she bargained for. Thanks to a smart script, workmanlike direction, and a solid cast, The Accountant is a better film than it has any right to be. It essentially asks the question: What if Rain Man put his genius to work for the bad guys? But Affleck gives such a restrained and nuanced performance, that just watching the ways his character processes the world, and interacts with those around him, is half the enjoyment here. The other half comes from discovering how that world interacts with Wolff, especially Cummings and King. The film has a couple of twists that you’re probably going to see coming before you’re meant to, and there’s a bit of standard gunplay and fight material, but lots of great little personal moments really carry this film a long way. 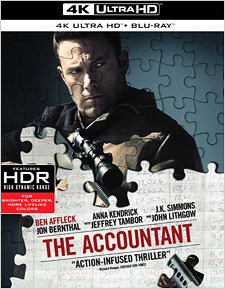 The Accountant was shot on film in Super 35 format, scanned and finished as a 2K Digital Intermediate. It’s presented here on Warner’s 4K Ultra HD Blu-ray upsampled to 4K at the original 2.39:1 theatrical aspect ratio, and with a very restrained HDR color timing pass. Fine image detail is good, with light grain and lovely texturing. The film’s color palette is cool by design, but the HDR opens up the range of subtle shadings in a pleasing way. Shadows are deep but detailed and the brightest areas of the image are natural looking and not overblown. Primary audio on the 4K disc is included in English 7.1 DTS-HD Master Audio. The mix isn’t flashy, but it’s a good match to the visuals, with a medium-wide front soundstage, good dialogue clarity, smooth panning, and nice atmospheric fill in the surround channels. When the gunplay begins, the mix is punchy with satisfying bass. Additional audio options include English 5.1 DTS-HD Master Audio, English Descriptive Audio (US and UK), and 5.1 Dolby Digital mixes in French (Québécois), French, German, Italian, Castilian Spanish, Latin Spanish, Portuguese, Czech, and Polish Voice-Over. Optional subtitles are available in those languages and many more. They’re all featurettes of the usual EPK variety, but they do provide some interesting interview clips with the director and cast, particularly Affleck and director Gavin O’Connor. You learn a bit more about the origins of the story and Affleck’s performance, get some background on Autism and how it manifests in different people, and see how the film’s stunt sequences were produced. The package also includes a Digital HD code on a paper insert. The Accountant should pique your interest early on and keep it engaged for most of the film’s running time. The story falls apart a little bit in the final act, with an obvious plot development or two, but the film’s characters are anything but clichéd and that’s its own kind of good surprise. This isn’t a film that really requires 4K and HDR, but it’s nice to experience it that way if you can find the right sale price.